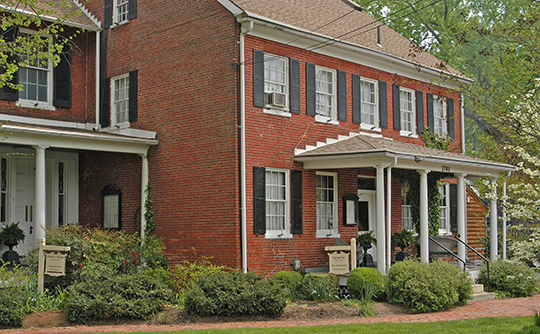 Elkridge, an unincorporated community and census-designated place, is the oldest settlement in Howard County, founded in the early 18th century. Photo: Elkridge Furnace Inn, part of the Elkridge Furnace Complex, Elkridge, MD. The Elkridge Furnace Complex was listed on the National Register of Historic Places in 1990. Photographed by User:Scott Saghirian (own work), 2014, [cc-by-2.0 (creativecommons.org/licenses/by/2.0)], via Wikimedia Commons, accessed November, 2016. Elkridge is a residential and trading center for farmers. As colonial Elk Ridge Landing, the towns shipped large quantities of tobacco, grain and timber. Agents were stationed here to assess the tobacco and to carry on other port functions. In 1765 the inhabitants hanged in effigy Zachariah Hood, Stamp Act agent for Maryland. Although tobacco trade decreased considerably during the Revolutionary War, forges and furnaces were busy here producing arms for the Continental Army. In 1781 Lafayette's troops camped at the landing for two days on their way to engage Cornwallis in Virginia in the final campaign of the War. Works Progress Administration, Federal Writers' Program, U.S. One: Maine to Florida, Modern Age Books, 1938, U. S. No. 1 Highway Association, Inc.